Fair Sentencing Act and Crack Cocaine cases before and after its implementation are going to get their day in the Supreme Court! Great news today from the United States Supreme Court. With a split in Circuit Court decisions regarding application of Crack Cocaine Sentencing Guideline reductions from the Fair Sentencing Act of 2010 (FSA), the Supreme Court has decided to hear arguments and resolve this issue once and for all. In Hill v. United States, the defendant asserts that the reductions in Crack Cocaine sentences which arose from the passage of FSA applies to all defendants sentenced after the date of enactment of the new law: August 3, 2010. Since the name “Fair Sentencing Act” implies that prior sentencing rules were unfair, its only logical to think that courts would apply the new guidelines to all defendants sentenced after its enactment, right? Wrong. Although the First, Third, and Eleventh Circuits have agreed with this conclusion, the 7th Circuit has decided to apply the new reductions only to defendants who committed their crimes after August 3, 2010. All defendants already awaiting sentencing after that day were still sentenced under the older, harsher rules. These cases are called “Pipeline” cases. FSA pipeline cases are where defendants committed and charged with their offenses before the enactment of FSA, but had yet to be sentenced. Many believed they would get a more fair sentence immediately following the bill’s enactment date, and many received no such relief. The Supreme Court must now decide if the application of the newer, fairer law should have been applied to all pending sentences as of August 3, 2010. If it decides that this is the case, the decision is a huge victory for a lot of defendants with FSA pipeline cases. Even if the Supreme Court decides that many defendants were sentenced under the old law unfairly, there is still work to be done. Each defendant must petition their sentencing court to reduce their sentence in the same way that the current USSC policy allows for. The biggest change that could come from this decision is the application of lengthy mandatory minimum sentences that could then be removed. Keep checking in for the latest on the Hill case! November has been a big month in the world of federal corrections. Due to all the recent events, this will be a lengthy post on all matters federal-criminal. The United States Sentencing Commission’s 2011 Amendments to their Guidelines Manual were enacted on November 1st. In these amendments, the Sentencing Commission made the Fair Sentencing Act of 2010 retroactive in sentence reductions. §841 (1) to manufacture, distribute, or dispense, or possess with intent to manufacture, distribute, or dispense, a controlled substance; or (2) to create, distribute, or dispense, or possess with intent to distribute or dispense, a counterfeit substance. §846 Any person who attempts or conspires to commit any offense defined in this subchapter shall be subject to the same penalties as those prescribed for the offense, the commission of which was the object of the attempt or conspiracy. In most Circuit Courts, commission of stated crime must have occurred after August 3, 2010 instead of just the sentencing occurring after this date. Exceptions are discussed in this prior post. Judges are now being told to cut people loose from federal supervised release and probation. Another amendment to the USSC Guidelines Manual specifically tells federal judges to consider early termination for anybody who is in their final phase of supervision. In basic terms, if a supervisee is done with treatment, community service, or any other requirement of probation that has an expiration, that person is eligible for early release. If all that is left on supervision is simply monitoring for violations, you have a good chance of getting free. More on this subject on our Federal Probation Termination page. The United States Supreme Court is collecting cases to hear on November 22, 2011 regarding application of Fair Sentencing Act reductions to “pipeline” cases (see exceptions, above). Davis and Hill are two of the cases regarding this issue that the Supreme Court needs to decide on in order to rectify a Circuit split. The 1st, 3rd, and 11th Circuits apply FSA to all cases sentenced after 8/3/10. The 7th Circuit applies the reduction to cases where the actual crime was committed after that date. All other Circuits are currently mute on the subject. Also on the docket is the issue of juveniles receiving Life Without Parole sentences. Originally discussed back in 2010 on Sentencing Law and Policy, the Supreme Court is now taking another look at the constitutionality of sentencing kids to die in prison. H.R. 2242, Fairness in Cocaine Sentencing Act of 2011 eliminates any disparity between crack and powder cocaine sentences. Its not retroactive, but makes the ratio that FSA brought from 100:1 to 18:1, down to 1:1. H.R. 2344, the Prisoner Incentive Act of 2011 rewrites the good time statute to make clear that a prisoner is eligible to earn up to 54 days of good time credit per year for each year of the prisoner’s sentence. Since 1988, the Bureau of Prisons (BOP) has interpreted the good time statute to award good time credit based on the time actually served by the prisoner, not the sentence imposed by the judge. As a result, prisoners only earn a maximum of 47 days of good time for each year to which they are sentenced, instead of the 54 days per year many believed Congress intended. H.R. 223, the Federal Prison Bureau Nonviolent Offender Relief Act of 2011 directs the Bureau of Prisons to release individuals from prison who have served 50 percent or more of their sentence if that prisoner: (1) is 45 years of age or older; (2) has never been convicted of a crime of violence; and (3) has not engaged in any violation, involving violent conduct, of institutional disciplinary regulations. The bill is intended to reduce overcrowding in federal prisons and give those nonviolent offenders over the age of 45 a second chance. For more information on bills currently in Congress, visit the FAMM page regarding the subject. As the holidays approach, hope can either strengthen or wane. PCR Consultants wishes all the best to the people it serves: Defendants, Inmates, Released Offenders, and their families. For more information on any subject here, give us a call at (480) 382-9287. In this previous post on early termination of federal probation, we discussed the factors judges must consider by law when deciding whether or not to let somebody on federal supervision go early. In this post we’ll discuss the policy factors judges consider when making these decisions. These policy factors are those that probation officers use when asked to make a recommendation regarding early termination of federal supervision. They are the standards adopted by the Judicial Conference Committee on Criminal Law in March of 2003. A close look at these factors show that there are a lot of areas to consider when attempting to terminate a term of federal supervision. The entire history of an offender is considered. Find out about these factors by reading our e-book specifically about early termination of federal probation. You can read our comprehensive e-book on early termination of federal probation here. Those that haven’t gotten into any trouble while on supervision, don’t see their Probation Officer’s more than just a few times per year, and are a complete waste of time and money for the government to continue to supervise, have the greatest chance for early termination. There are however, two factors not shown here than make the biggest difference. In the next post, we’ll take a look at both. In this first part to our series on early release from federal probation early (or supervised release), we’ll take a close look at the statutory factors that judges must consider when somebody on supervision asks for early termination. The only unbreakable rule here is that one year of supervision must expire before anybody can motion for early termination. The rest is up to the judge. The next installment deals with the factors by policy that judges do, or may, consider. Most of the factors judges must use to determine an appropriate sentence1 are also required to be used when terminating part of that sentence. Since probation and supervised release are part of a sentence, terminating them early is the same thing as reducing sentences. So what are these factors? You can read what these factors are in the law here. For a detailed review and discussion of what these factors mean, read our comprehensive e-book on terminating federal supervised release and probation here. l probation in specific cases. This is the first time they’ve every encouraged early termination of supervision at all. Not since the 80’s has there been a more advantageous time in the federal system to get released early from supervision. Whether on probation or supervised release, the USSC has realized that probation officers have too many people to supervise, and no budget to hire more probation officers. So the logical conclusion is to cut low-risk people free from supervision! To get started with your early termination documents now, contact us by e-mail or phone to get the process going. Its fast and easy! Read our free e-book on the A-to-Z of federal probation and supervision! PCR Consultants Has Published a Book(let)! 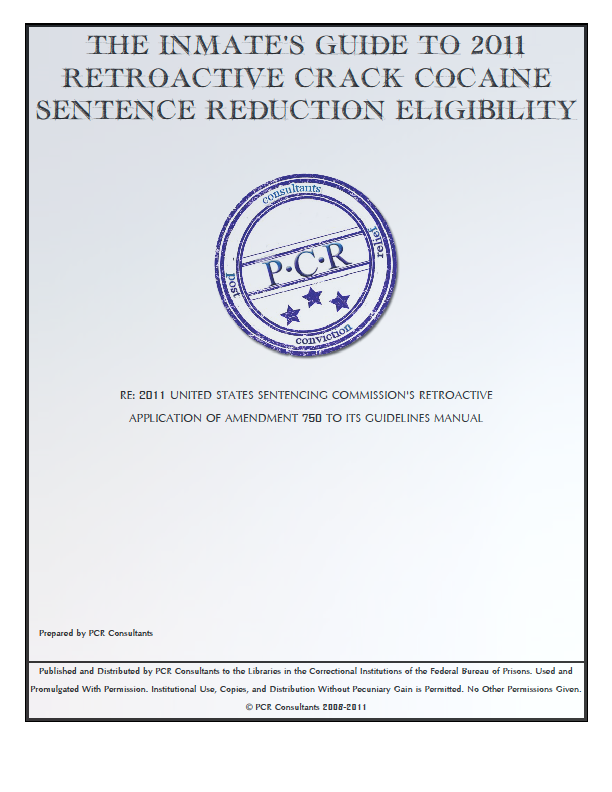 Many of the calls we get here at PCR Consultants are about the November 1, 2011 Sentencing Guidelines Manual Amendment regarding crack cocaine sentence reductions. The first question potential clients ask is about eligibility. Who is eligible? What makes or breaks eligibility? As part of our services to families and inmates who are interested in these sentence reductions, we conduct informal case-eligibility reviews to give confidence in eligibility based upon court records. Now, you can read all about what makes and breaks eligibility! Call us at (480) 382-9287 and get a free consultation to find out more information about how we can help you and your incarcerated loved one get these sentences reduced.